In this article we take a look into how can we set LDAP site affinity for VMware Identity Manager (vIDM) and VMware Identity Appliance (IDA) , especially when used as Identity Provider by vRealize Automation (vRA). We will look into native vIDM options that let us accomplish this as well as how to achieve this using F5 Big-IP Local Traffic Manager (LTM). When configuring vRA tenant you must configure an Identity Store. The Identity Store configuration specifies an LDAP server for the tenant against which tenant users will be authenticated. Refer to the VMware Identity Appliance which is used by vRA 6.x as IDA. Refer to the VMware Identity Manager which is used by vRA 7.x as vIDM. This configuration is acceptable but you might end up with high vRA login times. Let’s see why this happens and how to better design our LDAP server strategy. Let’s say you have specified a domain name vmware.com for the LDAP server. DNS will return all _ldap records found in a round robin fashion. In this example there are two records. There is an option in SSO appliances called site-affinity. Enable site affinity when establishing connection to AD. When not set, by default, user specified connection string(s) are used. What this means is that if you have tenants logging from different domains, for example de.vmware.com and usa.vmware.com (these might not be in parent-child relationship) will get from DNS only LDAP servers that are located in the domain they are logging from. You can also use BIG-IP virtual server ip (VIP) as an LDAP server in SSO appliances. This VIP might contain a pool of LDAP servers as members. Let’s take a look into few use cases and see how we can affect this process. There are _ldap Service Locator resource records for all of the DC’s above. If you configure both TenantGER and TenantUSA with a single LDAP server, for example dcusa01.usa.vmware.com, vRA Clients logging from GER (TenantGER) might experience slow login times because the LDAP server is located in USA. And vice-versa. If you configure both TenantGER and TenantUSA with a domain name, for example vmware.com, vRA Clients logging from both GER (TenantGER) and USA (TenantUSA) will receive an LDAP server via round robin from the DNS server which is located in their local site. DRAWBACK: In all cases if an LDAP server is down the SSO appliance will not be able to determine that and might try to authenticate against it and will fail. As you can see no health checks are performed against the LDAP servers returned from DNS. In this use case we have only one domain vmware.com, therefore enabling SSO site-affinity will not make a difference. If you configure both TenantGER and TenantUSA with a domain name, for example vmware.com, vRA Clients logging from both GER (TenantGER) and USA (TenantUSA) will receive an LDAP server via round robin from the DNS server. Both tenants might experience intermittent slow login times because they might get an LDAP server which is not in their geo region. If you configure TenantGER with a LDAP domain name ger.vmware.com and TenantUSA with usa.vmware.com, this would be an optimal solution as each tenant will receive an LDAP server based in his domain. If you configure both TenantGER and TenantUSA with a domain name, for example vmware.com, vRA Clients logging from both GER (TenantGER) and USA (TenantUSA) will receive an LDAP server via round robin from the DNS server which is located in their local site. This is because of the SSO Site-affinity. You have configured an F5 BIG-IP LTM VIP called f5-a-01-vs-ldap.vmware.com. This has as pool members the DC’s in both USA and GER: dcger01.vmware.com , dcger02.vmware.com, dcusa01.vmware.com and dcusa02.vmware.com. If you configure both TenantGER and TenantUSA with a single VIP f5-a-01-vs-ldap.vmware.com, vRA Clients logging from GER (TenantGER) might experience slow login times because the LDAP server is located in USA. And vice-versa. ADVANTAGE: F5 BIG-IP LTM can monitor the members of the LDAP pools and determine when they can or cannot response to an LDAP query by making constants probes. If a server cannot response to the LDAP query it will not be returned to the SSO appliance. This way we can achieve DC resiliency and optimize login process. If you configure TenantGER with the VIP f5-a-01-vs-ldap-ger.vmware.com and TenantUSA with the VIP f5-a-01-vs-ldap-usa.vmware.com as LDAP server, vRA Clients will be redirected to the LDAP servers in their geo. ADVANTAGE 1: F5 BIG-IP LTM can monitor the members of the LDAP pools and determine when they can or cannot response to an LDAP query by making constants probes. If a server cannot response to the LDAP query it will not be returned to the SSO appliance. This way we can achieve DC resiliency and optimize login process. ADVANTAGE 2: Each tenant will get an LDAP server based on geo location. As you can see F5 BIG-IP adds the benefit of health checks against the LDAP server which provides in turn higher LDAP resiliency . Next I will show how to enable SSO site-affinity and how to configure F5 BIG-IP LTM for LDAP resolution. You can enable the SSO site-affinity option for the IDA by logging via ssh to appliance and using the sso—config.sh. You will need to specify the vRA Tenant and Identity Provider for which you want to enable the option. Now login to the vRA Default Tenant and use a domain name like vmware.com for the LDAP server. Login to F5 and navigate to iApp > Application Services > Create. From the template menu select f5.ldap. In this case the BIG-IP device will use the domain admin account administrator@vmware.com (CN=Administrator,CN=Users,DC=vmware,DC=com) and query AD for an object which in this case is set to the administrator user account object ((&(objectClass=user)(name=Administrator)). You can specify any other AD object you want to query for. This is the LDAP health check that the BIG-IP device will do to determine if an LDAP server is up and running. Navigate to Local Traffic > Network Map. Verify that all LDAP serves are up and running. Navigate to Local Traffic > Virtual Servers. Verify that the VIP up and running. Lets login to vRA and add that VIP as LDAP server. Navigate to vRA Default Tenant > Administrator > Tenants. 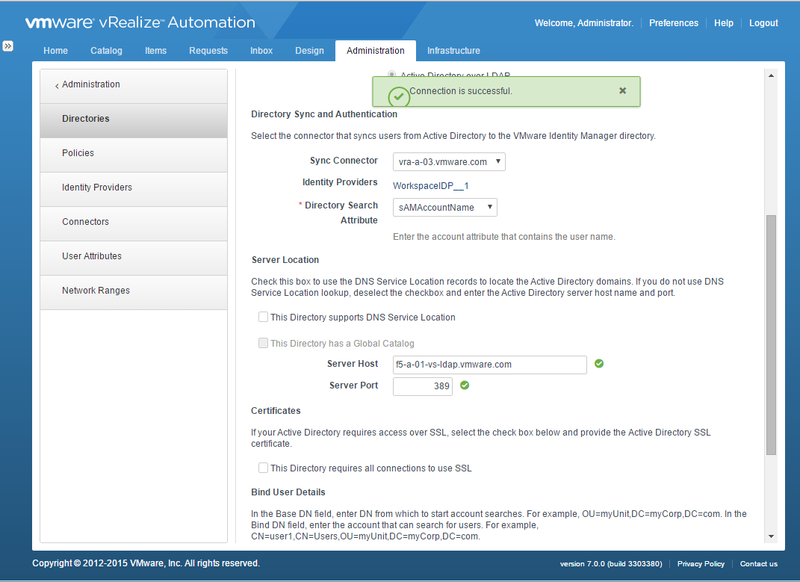 Try logging to the vRA tenant you’ve configured before with a domain account. You should see similar events being logged to the vmware-sts-idmd.log log. Let’s simulate an LDAP server failure. Navigate to F5 > Local Traffic > Network Map. After a note that node failure is detected. The BIG-IP device will not use that LDAP server anymore in any responses. 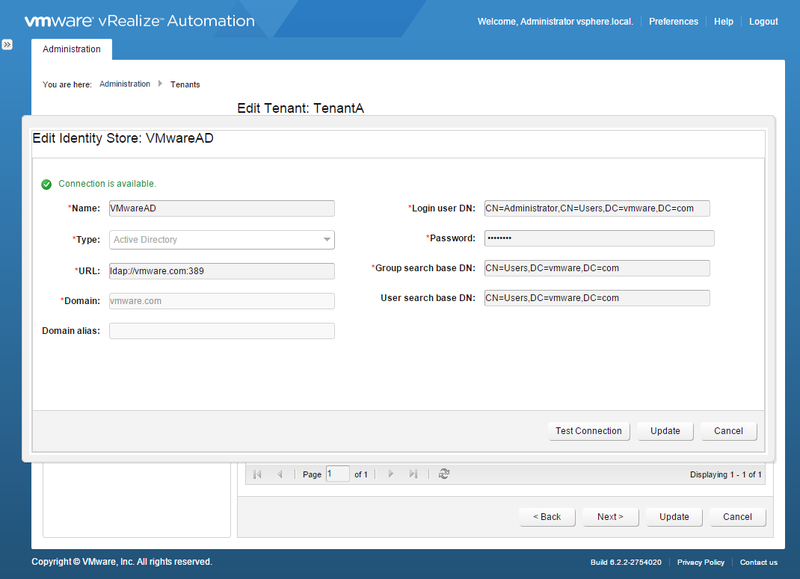 Try logging again to the vRA tenant you’ve configured before with a domain account. You should be successful because at least one node of the VIP is still alive and responding to LDAP queries. Let’s switch nodes and simulate failure of the other node. Let’s simulate failure of both nodes. 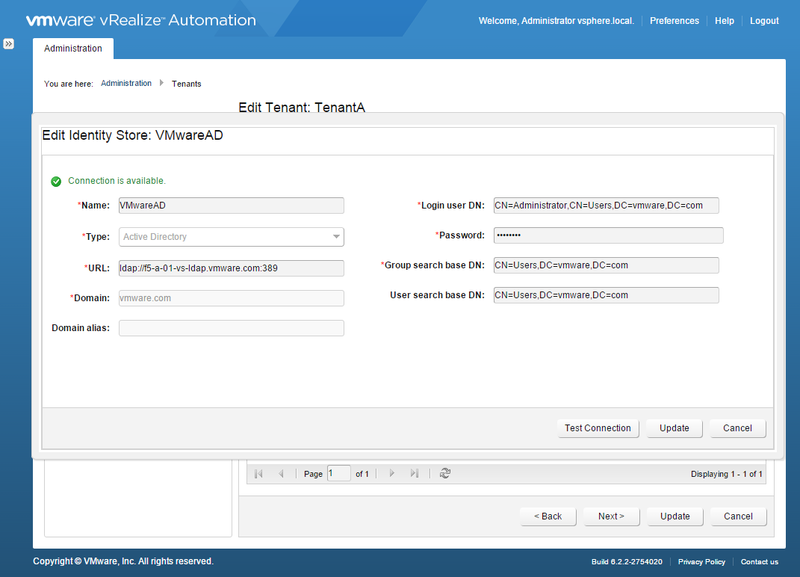 Try logging again to the vRA tenant you’ve configured before with a domain account. You will not successful because there are no more nodes alive and responding to LDAP queries. The BIG-IP device configuration in this case is the same as the one which we used above to configure LDAP Site-Affinity for vRA 6.x using F5 BIG-IP. To set the BIG-IP VIP LDAP in navigate in vRA <TenantID> > Administration > Directory Management > Directories and remove the check for This Directory supports DNS Service Location. You can perform the same tests we did when we set up LDAP Site-Affinity for vRA 6.x using F5 BIG-IP earlyer. This entry was posted in F5, LDAP, LTM, SSO, vIDM (SSO) and tagged f5, ida, identity appliance, identity manager, ldap, site-affinity, SKKB1024, sso, vidm, vmware, vra, vrealize automation. Bookmark the permalink.